Who likes to eat fried rice? Well turns out many devotees yes. Indeed, this menu is a simple menu that is always tempting. Processed in a way that is very easy, it is always satisfying and indulgent stomach. Especially when coupled mushrooms, cheese, chunks of chicken or beef. Hmmm ... is looming warmth in the mouth? 1 Saute garlic and onions until fragrant, then enter the chicken and shrimp and stir until cooked. 2 Add the rice, scrambled eggs, peas, fish balls and spring onion, stir until blended. 3 Add the oyster sauce, fish sauce, pepper powder and salt, mix well and mature. 4 Serve warm fried rice with additional pickled cucumber and prawn crackers. Fried rice with chicken or sausage would have been usual, this time you can create a new menu that is not less delicious. Button mushrooms and oyster mushrooms can be the ingredient to a tasty menu of fried rice. 1 scrambled eggs, remove, set aside. 2 Saute garlic until fragrant, enter button mushrooms, oyster mushrooms and peas, stir until cooked. 3 Add the rice, scrambled eggs, scallions, sesame oil, salt and pepper, stirring until well blended and cooked. 4 Turn off the stove and serve while warm fried rice. Well, so that your child interested in eating homemade fried rice, we have to be very clever to also present it in a way dong style restaurant. Fried rice wrap with cheese omelette seems interesting deh. Let's try it. 1 Mix the eggs with salt and water, stirring until fluffy. Add flour and stir until dough blends perfectly. 2 Heat a teflon pan over low heat, cook until cooked omelette. Keep the omelette cook on low heat so that the skin does not burn and stay pretty perfect. Remove, and set aside. 3 Heat the wok, stir-fry seasoning that has been refined to smell the fragrant aroma. Add chicken then stir-fry until cooked. 4 Saute the rice until the spices are well blended. Enter chopped cabbage, green onion, soy sauce, soy sauce and stir-fry again until blended. Lift. 5. Print square shaped rice then wrap by using ready-made omelette. Garnish with shavings of cheese or sauce. The shrimp were tasty and chewy delicious blend could be in a warm plate of fried rice. Let's make this delicious fried rice. Suitable as a practical dish for breakfast. 3 Enter the peas, carrots and spring onions, stir until slightly wilted. 4 Add the rice, salt, pepper, soy sauce and sesame soy sauce, ouch until blended and cooked. 5. Lift rice and serve while warm. 6 Can you add a fried egg or egg if desired. Special Fried Rice should not be enjoyed from an expensive restaurant. You can present the Special Fried Rice for the whole family with this recipe. Come try it today, perfect for breakfast or dinner menu. Heat the butter, saute ground spices and red chili until fragrant. Add the rice, chicken, and shrimp, stir until blended. Add tomato sauce and soy sauce, stir-fried rice stir until cooked, remove from heat. Serve warm with a sprinkling of fried onions and fried eggs. 1 Saute garlic until fragrant, then add the onion, carrots and white rice. Stir until evenly distributed. 2 Add broth powder, light soy sauce, pepper powder, sugar, scallions, and cashew nuts. Stir until all ingredients cooked through. 3 Enter the lychee fruit and stir briefly. Serve while warm. 2 Saute until yellow and fragrant spices, then put tomatoes and fry again. One after another with chicken and shrimp. After the new tender and cooked rice enter. 3 Add the soy sauce if less prevalent. Newsletter enter pineapple and green onion, fried rice ready to serve. 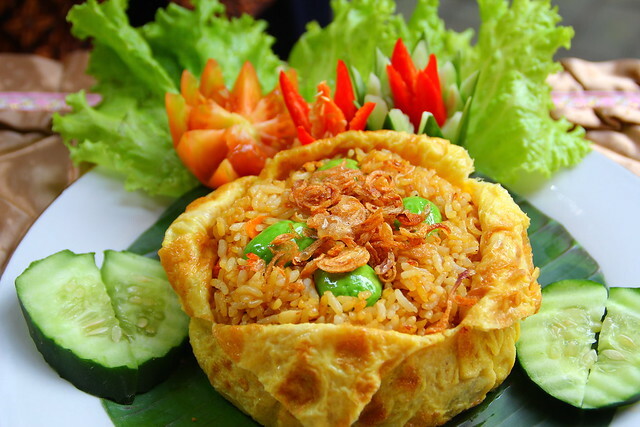 Fried rice is a food that is often chosen as the delicious meals at breakfast or dinner. 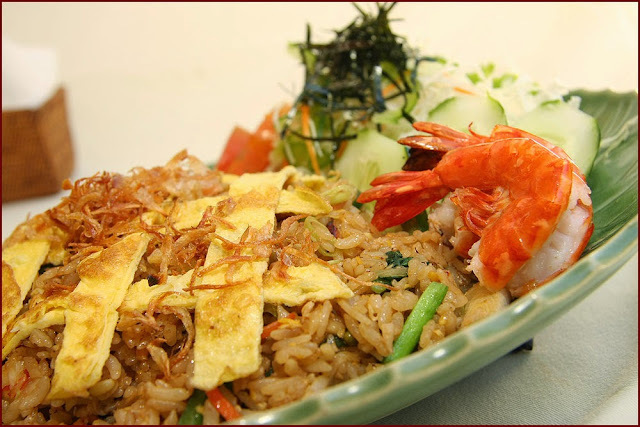 Well, if you are a fan of fried rice, there is no harm in experimenting in making it. As performed by Son Priyadi, owner of Strawberry Cafe. Through his courage, this white man has created a new innovation in making fried rice. Curious? Let's try to make fried rice ala Strawberry Strawberry this cafe. One egg fried chicken, then set aside. Fried and cut into small meatballs and chicken thighs and set aside. Saute the spices that have been mashed until fragrant, put a raw egg and red pepper and scrambled until cooked. Put the rice, stirring until the spices evenly. Garnish the rice with pickles, sliced ​​strawberries, and crackers. Good luck! 1 Response to "8 RESEP NASI GORENG SPECIAL KELAS RESTORAN BERBINTANG "